Links to Klook are affiliate links and helps us keep the website running. Welcome fellow Explorers to another edition of our Hong Kong Disneyland Trip Reports! Our latest trip took us to Hong Kong during their Halloween Time celebration. This is an event I have been dying to experience. Our multi-day trip report goes in-depth about what we experienced, ate, and the troubles we ran into. Overall, it was a fantastic trip and plans for another trip for the opening of the Iron Man Experience are underway! Let’s get started with our first day, which turned into a lost day due to Typhoon Haima, which closed down the resort for a day and canceled flights to/from Hong Kong International Airport. My scheduled flight out of Haneda Airport was delayed due to Typhoon Haima. I was flying the day after the typhoon hit Hong Kong, but due to all the canceled flights it created a backlog of flights, which inevitably moved mine to a later time. Flight delays means time for shopping. I stumbled upon these Disney Travel Sky Selection items. Originally the flight was to leave at 06:30 but instead left at 14:30. I took a limousine bus from Kichijoji Station directly to the airport. This is my preferred way of getting to the airport from within the city. It’s much less hassle than taking the train from where I am in Tokyo. If you’re closer to the centre of the city, taking the train is a wiser choice. 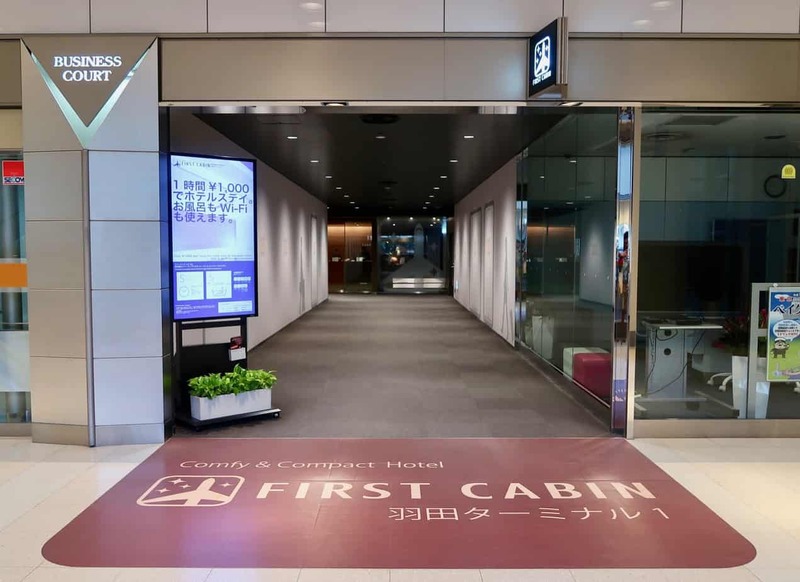 I booked the FIRST CABIN capsule hotel a month in advance. 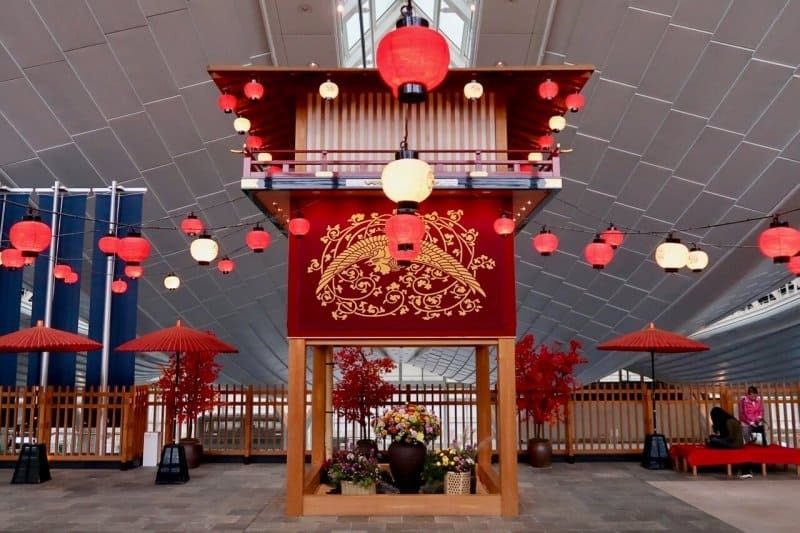 It’s right at Haneda Airport, which is a fantastic choice if you have a late or early flight. Read my full review of this affordable capsule hotel, which I highly recommend. I had a wake-up call for 03:00 to catch my flight—when I checked in my flight wasn’t delayed by this point—and shuttle bus to the other terminal. When I woke up, I noticed my flight was delayed. My checkout time was 04:00, so I went to the front desk and explained the delay and asked if I could check out at 10:00 (the latest you can check out) and I was told that wasn’t a problem. So back to bed I went for a couple more hours. I wanted to get a lot of rest for the next few days at the parks! My good friend Bryson was joining me at the parks for this trip as well. His flight with Qantas out of Sydney was delayed, but only by an hour. Since his journey is further than mine, he got lucky. 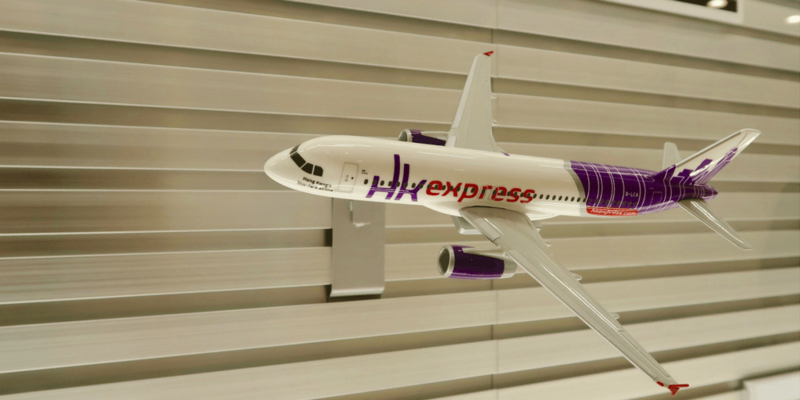 Once I got checked out of the hotel and scrounged up food from McDonald’s, it was time for my flight with Hong Kong Express! This is my preferred airline for travel between Tokyo and Hong Kong. They always have sales and are a no-frills airline, which is perfect for budget travel within Asia. Don’t forget to sign up for their rewards program, reward-u, to collect points to use towards flights, in-flight meals, and extra check-in luggage. I arrived at the airport with no issues, went through immigration without a hitch, and made my way to arrivals to wait for Bryson to arrive. The plan this trip was to not bother with a SIM Card for my unlocked iPhone since Hong Kong Disneyland offers free wi-fi in the parks and the hotels. But, as I was about to exit the arrivals area, I saw a sign for SIM Cards and decided to get myself one. For the price, I couldn’t say no. For HK$80 (~$10.30USD), I got a 1.5GB LTE SIM Card to use for 5 days. It was dead simple to buy and set up. I bought it at the service counter just before you exit the arrivals gate. They had a gentleman that installed and set up the card for me. He had proper tools to take out my current SIM card and put in the new one, and he had to phone a number to get everything activated. Now, I am not sure if you could do this yourself, as when he phoned the number it was in Cantonese. So I can’t say whether you could do it in English. My guess is that you can since English is everywhere. He asked if I wanted the 1.5GB LTE plan or the 3G Lite plan for 10 days. You have to choose which one you want (it’s the same price) when it’s set up. I chose the 1.5GB LTE Plan since I was only there for a few days. There is an option to refill your data online if you use it all. All this information is printed on the packaging. 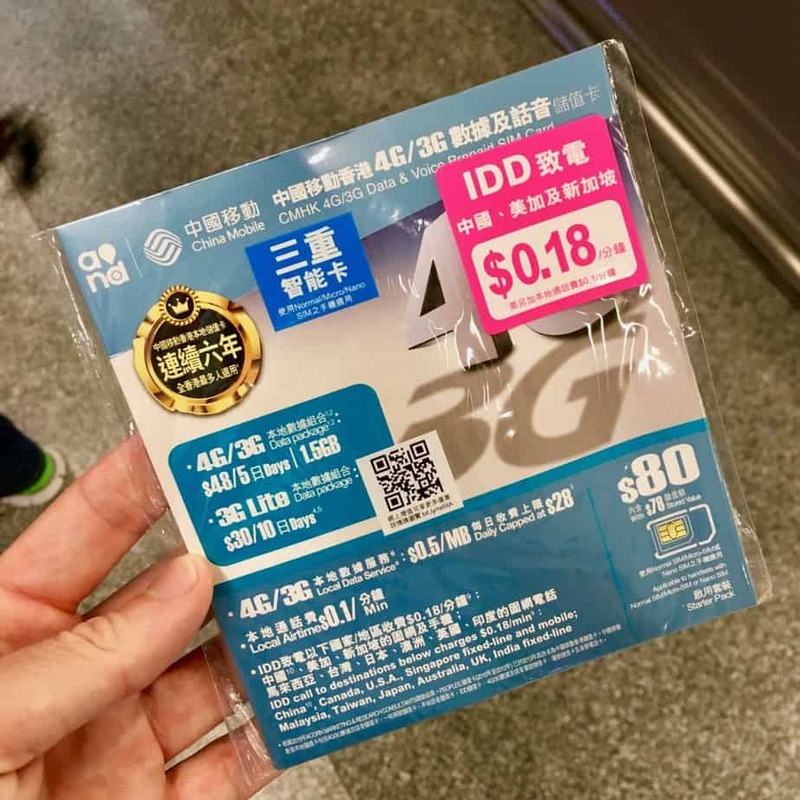 If you want a SIM Card ready to go before you arrive in Hong Kong, then this one from Amazon I recommend. I ordered it when visiting Shanghai and used it with no problems. After about 2 hours Bryson’s flight arrived and we made our way to the resort—after having the obligatory McDonald’s. Since we were staying right at the resort, it was much easier to take a taxi to the hotel compared to the metro. There is a marked sign which tells you where the different colour taxis go. 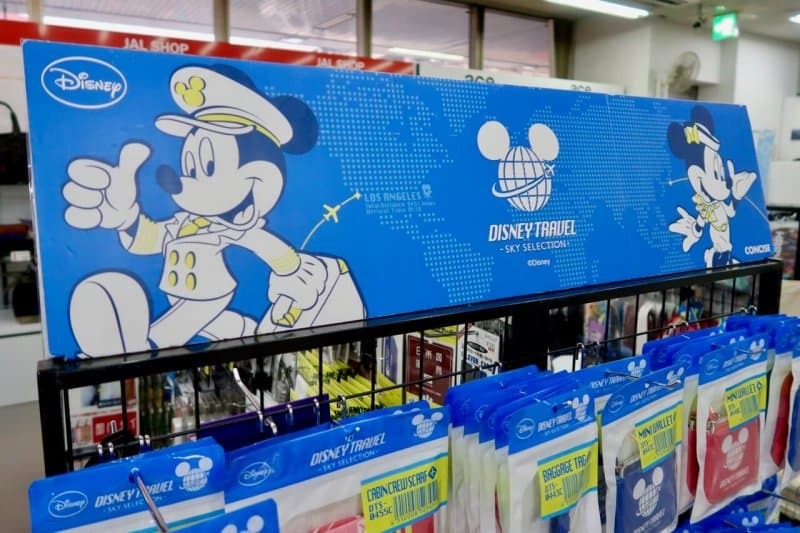 The blue marked one includes Hong Kong Disneyland Resort (Lantau Island). We walked up and a woman asked us where we were going and we said, “Disney’s Hollywood Hotel.” She gave us a printed slip saying about how much the ride costs. The ride took about 20 minutes and cost us about HK$130 (~$16USD). While a bit more expensive than the metro, the convenience is worth the price. If you’re staying right in the resort, then this method I can’t recommend enough. It’s cheap and easy. If you’re staying right in the city, then taking the metro is your better bet as a taxi ride will cost more. The original plan was for me to arrive early in the morning—around 10:00—to the resort and have the day to explore the park while waiting for Bryson. But with the delays that did not happen. We got to the hotel around 20:00, which didn’t leave much time for the park. We booked both Disney’s Hollywood Hotel & Hong Kong Disneyland Hotel for 35% off and an upgrade each night with one of their deals. I recommend keeping an eye on their deals page before booking your trip. Check-in was a breeze and came with a couple of surprises. When we checked in, the Cast Member greeted us with “Welcome back, Mr. Nilghe!” which was a pleasant surprise. After she got us checked in, they took our photo with a Halloween-themed frame to email to us (I lost the email because that is how my luck is sometimes). Towel animals decorated our room and we received “welcome back” buttons! We went to our Deluxe Room and there were various towel animals throughout the room and one, in particular, stood out. In front of the animals was a messaged made of pipe cleaner which read “Welcome Back” in cursive! But that wasn’t all. About 10 minutes after we got to the room, we heard a knock at the door. 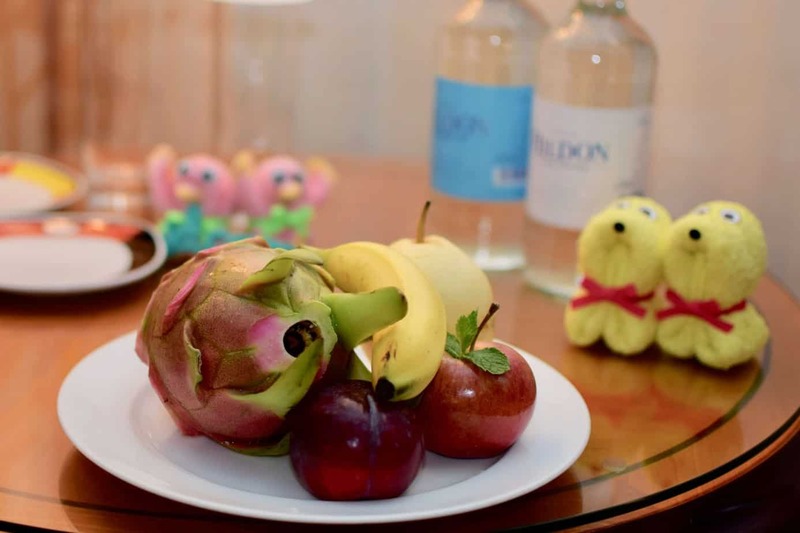 It was room service and they brought us a plate of fresh fruit and two glass bottles of water (sparkling and still)! A brilliant way to end our long travel day. Bryson went to the resort earlier in the year, just before the Grand Opening of Shanghai Disneyland, and had an unused 2-day child ticket from the package they had bought. He was able to use that ticket and upgrade to a Student Platinum Magic Access Pass and saved himself 25%. Not bad. For myself, I purchased a discount Hong Kong Disneyland Park Ticket from Klook on their website and printed off the voucher. You save 8% off a one-day ticket at the park. The voucher is changed into a hard ticket right at the park gates at the ticket machines. Before bed, we got our Toy Story outfits ready for the park. 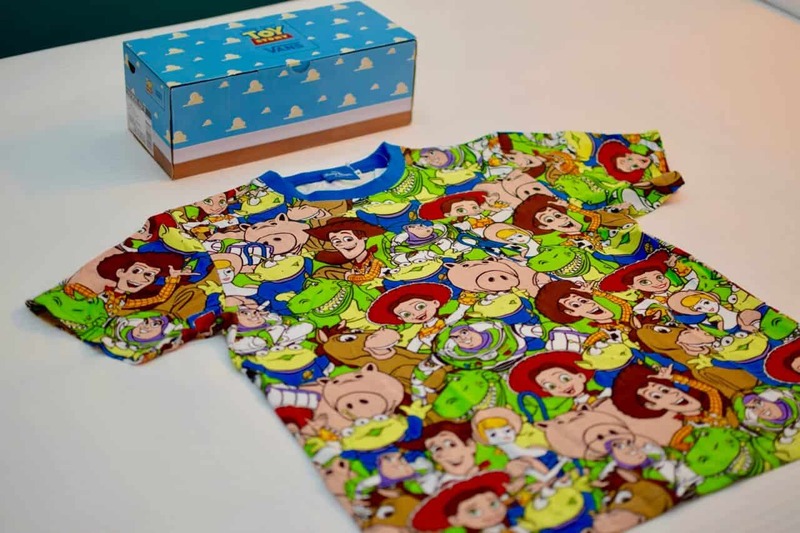 I bought shirts from Tokyo Disney Resort and Bryson bought the new Toy Story Vans in Sydney. He was Buzz and I was Woody. We were ready to get our pictures taken in Toy Story Land! Our first day didn’t turn out how we wanted, but we made the best of it. The best stories stem from the unexpected. 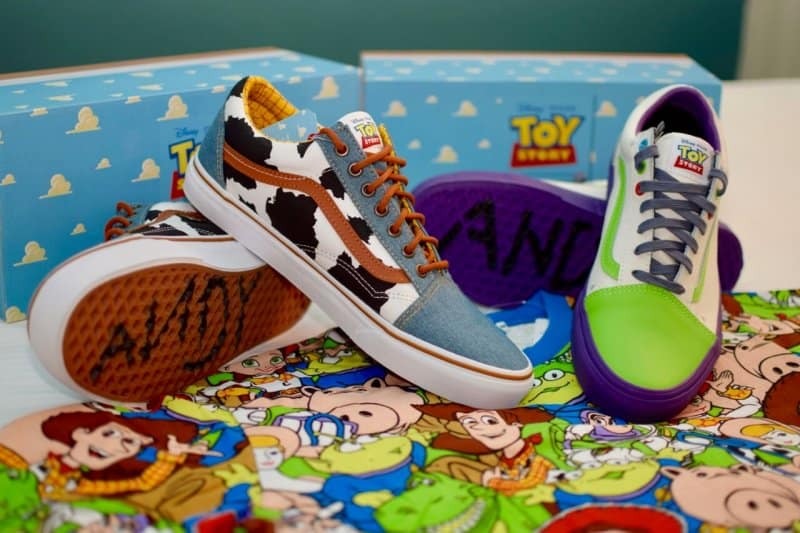 Buzz Lightyear and Woody Vans to wear in the park! Read part two of our Hong Kong Disneyland Halloween Trip Report! Did our trips overlap? We traveled to HK from Shanghai the day after the Typhoon, took a day off then went to HKDL. We were there October 22 to 26. So we probably did!